An accessible bathroom for Chris — THANK YOU. 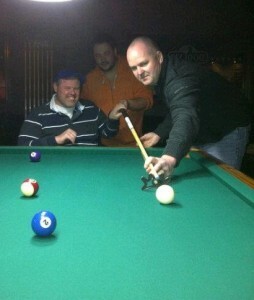 Posted By: admin Tag: Community | Comments Off on An accessible bathroom for Chris — THANK YOU. 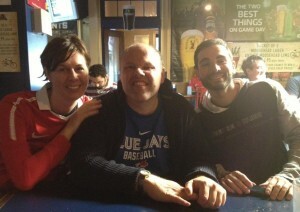 Heather, Chris and Dan cheering on Manchester United. Chris Jordan’s dream bathroom doesn’t have crystal, marble or a rain shower head. 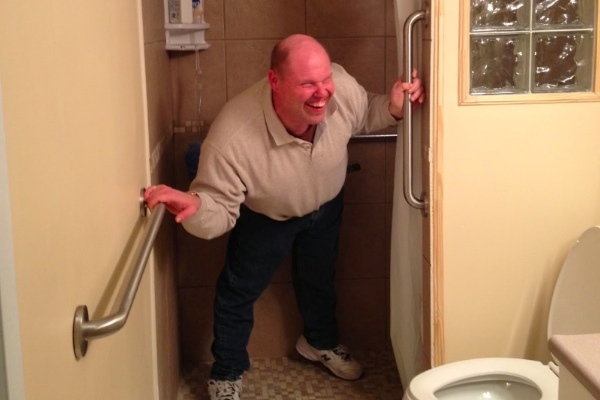 He needs a physically accessible bathroom and only $1,000 stands in the way. 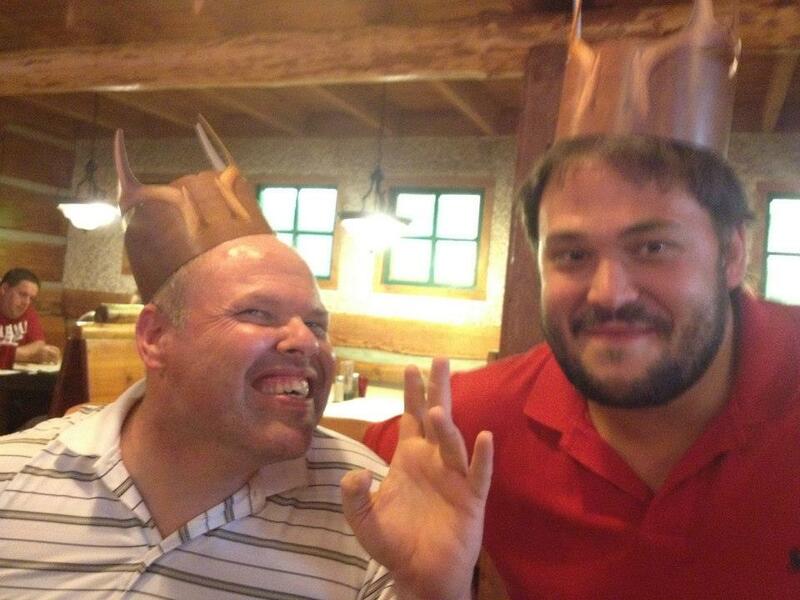 Living with multiple disabilities has never stopped Chris from wanting the same things as other adults: an active social life, being close to his family, interesting work and to live on his own with friends he chooses. This final goal has been the hardest to achieve for the 38 year old. Chris’ parents are ageing and ill, adding increased urgency to Chris finding stable and supportive housing. Chris Jordan celebrating his birthday with Chris Scott. After much searching, Chris has found an apartment where he’ll live with Chris Scott, who is both his friend and care provider. Additional assistance will be provided by a local agency that supports adults with disabilities living in ‘home share’ (the system’s jargon for living in a care provider’s home under the supervision of an agency). But, the apartment bathroom isn’t accessible and Chris can’t move in until it is. Chris has some ability to walk and needs a shower stall without a lip or ledge plus a network of strong grab bars to support his weight. Chris’ dream to live on his own is now within reach. The only thing standing in his way is fundraising the final $1,000 for building materials. Chris J, Chris S and me. Please support Chris’ Christmas wish. Donations can be made to the Ottawa Rotary Home Foundation on-line, by phone to 613-822-5391 or by mail to the Ottawa Rotary Home at 4637 Bank Street, Ottawa ON, K1T 3W6. Please specify you are donating towards Chris Jordan’s bathroom. Update December 12, 2012 10:43 a.m.
$350 has been raised! We’re $650 from a new bathroom. Update December 13, 2012 2:36 p.m.
Update December 13, 2012 3:33 p.m.
$1000 raised. 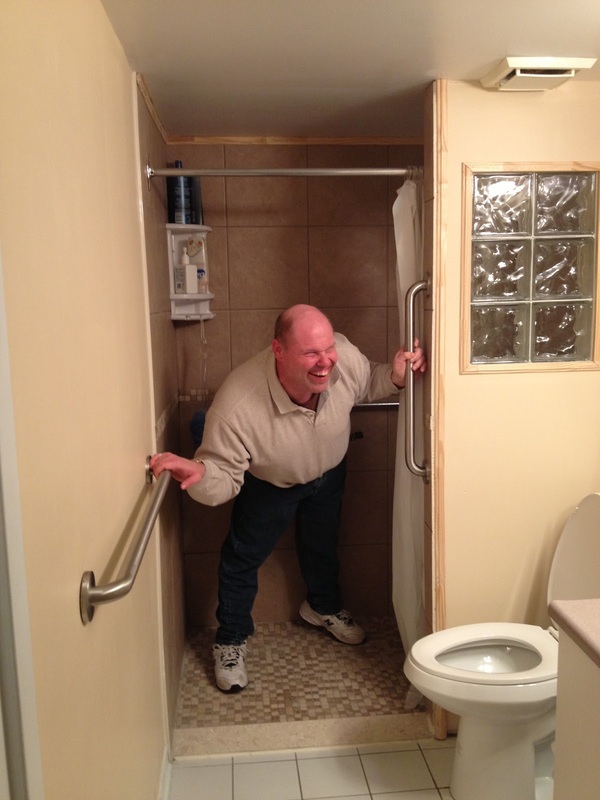 Thank you everybody for helping Chris achieve his dream for a stable place to call home with an accessible bathroom. Back in December, Chris Jordan was so very close to his goal: to live in a stable home with a person of his choosing. His friends and supporters were working hard to raise the funds needed to turn a standard bathroom into an accessible bathroom. That last $1,000 seemed to be the hardest. Then you came along. THANK YOU to the many people that generously donated to Chris’ dream when they read the message above. Many of you have never met Chris, but you opened your hearts to support his dream. You are the best kind of people. It’s beyond touching. Bathroom after. Chris loves it! The bathroom has been renovated, including a raised toilet, accessible shower that Chris can walk into and a network of grab bars. Chris Jordan has moved into the apartment he now shares with Chris Scott. Chris sends a huge THANK YOU to everyone that made this possible. Chris, Chris, Heather and I had dinner together tonight at the apartment and it was rather emotional at one point. Living here means so very much to him. And, the stability means the world to everyone that cares about him. Please know what a wonderful difference your donation has made to a terrific guy. Chris is thrilled with the result and gives you a tour in the video below.